Congratulations on the birth of your baby! To bring new life into the world is a very special gift. We welcome your baby into our parish community. Baptism is the first step in your child's journey to God. Your own faith is essential for the steps which follow. You will be promising to bring up your child in the practice of the faith, knowing God as a loving Father. You are asking the parish family to help you with this. In baptism your baby becomes part of a wider family - the Church. 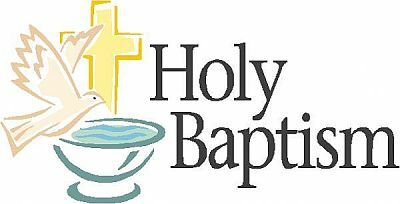 Baptism then is a personal response to the invitation of Jesus. At Baptism, through the pouring of water and anointing with Chrism, the child becomes a member of the Church. Baptism is only a beginning. It will be your duty and privilege to help your child grow up in the knowledge, love and grace of God. For the seed of faith sown in Baptism to flourish, it needs your love and care. The way you live, the way you love each other, your attitude and beliefs, your worship at Mass each week and the prayer you say, morning and evening, will all contribute to your child’s experience of what it means to be Christian – to grow up in the love of God. Water – Water is the central symbol of baptism. It symbolises new life, nourishment and growth. The White Baptismal Garment – The white garment is the uniform of the newly baptised. It is a symbol of their new identity as members of God’s family. Early Christians dressed in white for a week after they received their Baptism; it was a sign to others that they had made a new beginning with Christ. The Candle – The living flame of the Easter Candle is a sign of the risen life that the baptised share. This is a symbol of our faith in Jesus who is the light of the world. The Readings – The Word of God speaks to us as it did to the first believers. I. the oil of catechumens protects and strengthens the child for the Christian life.